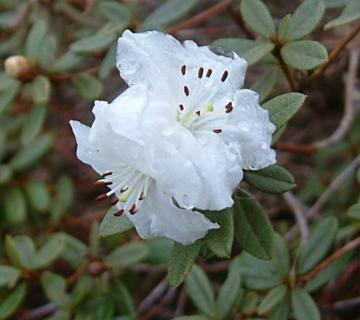 Compact, low spreading, dwarf evergreen with small scaly dark green leaves. Trusses of two or three pure white small flowers, freely produced from early to mid spring. Moist, well drained humus rich acid soil. Tough and drought resistant. Hybrid of R. leucaspis x R. orthocladum var. microleucum.